In this introductory workshop, we orient participants to our approaches to embodiment practices and contextualize key topics from our books and immersive trainings. The goal is to encourage easeful movement, refreshing connection to our bodies and to the places we live and love. Begins Friday at 6 p.m. and ends Sunday at 3 p.m.
$375 plus $50 per night housing ($350 for registration by Feb. 1 with $50 non-refundable deposit). In this immersive residential workshop, we draw from ten Body and Earth themes that we have investigated and articulated over the last three decades as movement artists, educators, and authors. Modeling collaborative teaching, we both differentiate themes and approaches, and appreciate the overlapping interconnectedness of topics that circulate between science and embodied experience, stimulating creative imagination, artistic forming, and self-care. Our intention is that these practices are useful for daily life as well as profound resources for facilitating others in embodied awareness and experiential learning. Begins Tuesday at 10 a.m. and ends Sunday at 1 p.m. Body and Earth Training Topics include evolutionary movement, experiential anatomy, body and earth systems, authentic movement, the tonic system, voice and language, the nervous system, creative forming, the Be-ing score, and sustaining mystery. Both workshops are held at Resources in Movement on beautiful White Oak Pond in Holderness, New Hampshire. Housing is self-catered in Cloverly Cottage, an elegant gathering site for movers and thinkers that has hosted in-depth conversations throughout the past century—including Gregory Bateson, Margaret Mead, and many others—considering how best to honor our global home, including the human body. Body and Earth with Caryn McHose: Thursday June 7th, 9-10:30am, Berenson 3. Panel with Bonnie Bainbridge Cohen and Nancy Stark Smith: Friday, June 8th, 3:50-5:35pm. Join fellow dancers and friends across reunion years in honoring Professor Andrea Olsen—dancer, writer, educator—on the occasion of her retirement after 36 years at Middlebury. Come share a memory and a movement. Shruthi Mahalingaiah ’98 has organized a short program with remarks. A collaborative performance between Historic Northampton and A.P.E. 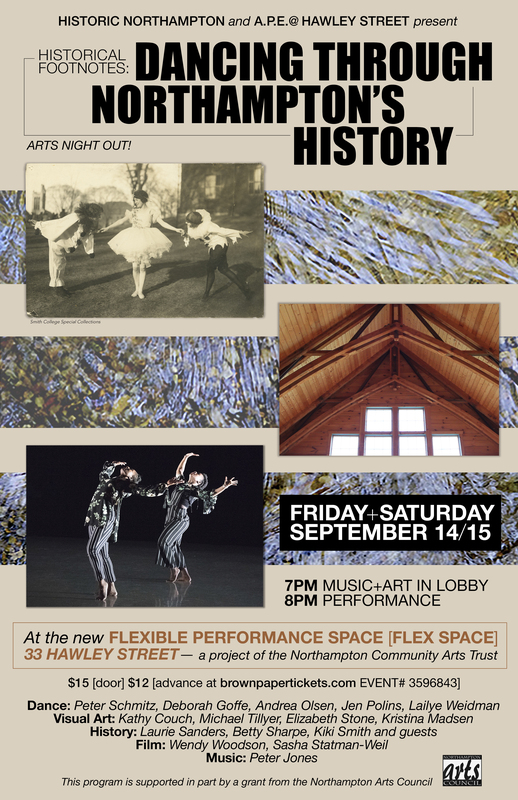 @ Hawley Street, linking contemporary dance works, site-specific films, music, and visual art with Northampton’s rich history. Twelve area artists and their collaborators will offer a range of surprising ecological and cultural perspectives, all with ties to Northampton’s past. Engaging the imagination in multiple forms, this event will celebrate the opening of the Flexible Performing Space at 33 Hawley Street, a project of the Northampton Community Arts Trust. This class is an opportunity to work with perception and movement to foster changes in coordination that evoke easeful, natural movement. Percentage of proceeds supports the Bates Dance Festival 35th Anniversary! Friday, November 13, 2015 6-7:30 p.m, Contact Quarterly 40th Anniversary Celebration, 7:30-8 p.m.
$800 plus housing ($700 for early registration by February 1, 2014 with $100 non-refundable deposit). Aveyron, South of France. June 1-6. Ghent, Belgium. May 27-June 1. Presenting May 31. Performance: Sunday March 29, 2 p.m. at Kendall Hall Studio 3, Mount Holyoke College, South Hadley, MA. Free. Tuesday, March 4 at 5 p.m. Dancers Christal Brown, Catherine Cabeen, Andrea Olsen, Peter Schmitz, and Doug LeCours; MC’s Caryn McHose, Alex Draper and Helen Young; lighting designer Jennifer Ponder; musician/author John Elder; and dramaturg Dana Yeaton. Free, but limited seating so come early. Saturday, April 12, 5 p.m. WINDOW, 126 Main Street, Northampton, MA. Scott Dance Studio, Smith College (off Green Street), Northampton, MA.